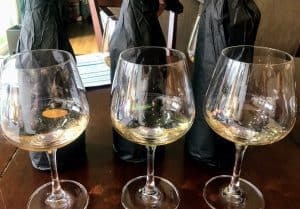 UPDATE: Apparently there was evidence of cheating during the tasting portion and the results of that segment of this year’s Master Sommelier examination has been invalidated. All Masters who passes this year’s test will have to resit this exam. Earlier this week the Court of Master Sommeliers announced an astonishing 24 new Master Sommeliers. All together 56 individuals sat for the exams which is taken in three parts. This first is a theory examination that covers the wines and wine regions of the world. Candidates need to know wine laws and production methods as well as details about cigars, spirits and liqueurs. This is followed by Practical examination which includes demonstrating proper table service. Then finally a blind tasting of 6 wines in 25 minutes using the famous Grid Method of Deduction. To pass, candidates must receive a score of at least 75% in all three parts. With this year’s bumper crop, we saw an incredible 42.8% pass rate. That’s not bad for something that has been described as the World’s Toughest Test. A Perfect Storm for a Windfall? Last year the court announced 8 new Masters out of 58 candidates for a 13.7% pass rate. In 2016, there was a minuscule 4.7% pass rate as 3 out of 63 candidates successfully completed all 3 exams. The year prior, in 2015, 7 out of 63 passed for a 11% rate. Now what those numbers don’t tell is how many individuals passed 1 or even 2 of the three exam components. These scores can be carried over to the next examination. Let’s say we have a candidate who passed the Theory examination in 2015 but failed Practical and Tasting. This candidate could then spend the next three consecutive years attempting to pass the remaining two. After that, though, unsuccessful candidates will need to retake the whole exam. It’s very likely that 2018 wasn’t the first rodeo for several of the 24 new Master Sommeliers. This could help explain why this year saw so many successful candidates. The film also popularize the idea of blind tasting beyond just professionals. One theory on the large class was that it was because more people were taking the exams. Credit is given to the 2013 documentary film SOMM for sparking interest in the field. This film followed the path of Ian Cauble, Dustin Wilson, DLynn Proctor and Brian McClintic as they took their examinations. Wilson and McClintic would go on to pass all the Master Sommelier exams in February 2011, being 2 of 6 who passed out of 30 (20% pass rate). The following year, Cauble would earn his MS as part of a group of 7 out of 62 candidates taking the exam (11.2%). In July 2013, only a few week after the film was released June 21st, 70 candidates sat for the MS exam with only one single person, Nick Hetzel from Sage at Aria Resort and Casino in Las Vegas, passing (1.4%). 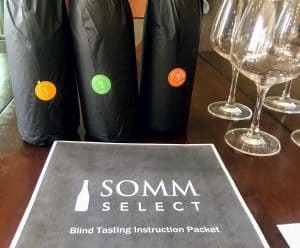 To even get an invite to take the Master Sommelier examination, candidates must first pass the Advanced Sommelier exam. According to the Court of Master Sommeliers, this exam usually has a 25-30% pass rate. Before taking that exam, candidates need to have previously passed the Certified Sommelier exam. Additionally, the Court recommends at least 5 years practical experience as a sommelier in the service industry. 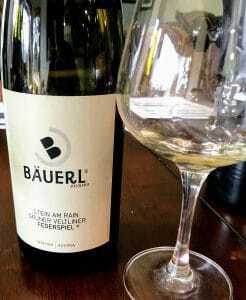 If there is a “SOMM bump”, it seems likely that 2018 is just the beginning of the swell. Are we just getting “Wine Smarter”? It’s possible that the “World’s Toughest Test” may not be as tough any more for a growing wine savvy community that is being spearheaded by wanderlust Millennials who aren’t afraid to branch out into the obscure, geeky and unknown. This ain’t your daddy’s Duboeuf. 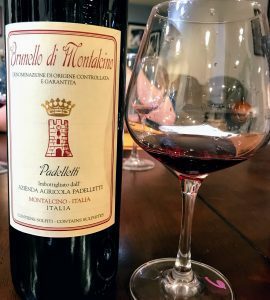 While previous generations of drinkers may not have strayed very far from the zones of Chianti and safety of Sangiovese, we now have regular wine drinkers (not just trained and studious sommeliers) waxing poetically about the difference between Nerello Mascalese grown on the volcanic soils of Mt. 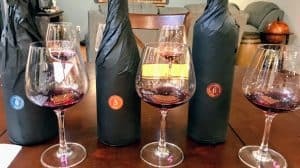 Etna and IGT Nero d’Avola. 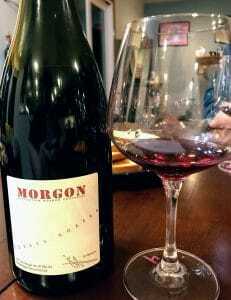 Now a days if you are talking Beaujolais, you are far more likely to be talking about the crus than you are of Nouveau. 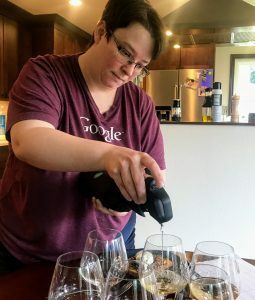 Blessed with a plethora of wine resources courtesy of the internet (like GuildSomm’s own fantastic website), it’s easier than ever for the curious wine lover to quench their thirst for some vino-knowledge. Are we seeing a “trickle up” effect from this groundswell of knowledge? As I mentioned in my post Playing the Somm Game in Vegas, the level of knowledge in the field has never been higher. As consumers get more savvy and adventurous, the sommeliers are upping their game. Perhaps the windfall of new Master Sommeliers (249 and counting since 1969) and Masters of Wine (380 since 1953) means that we are collectively on a crescent of wine expertise that we haven’t observed before. Or maybe the World’s Toughest Test needs to get tougher? 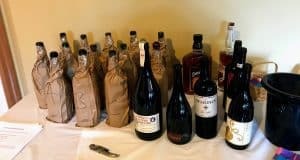 Tagged Beaujolais cru, Blind tasting, Brian McClintic, Court of Master Sommeliers, DLynn Proctor, Dustin Wilson, GuildSomm, Ian Cauble, Master of Wine, Master Sommelier, Nerello Mascalese, Nero d'Avola, Nick Hetzel, Somm film. 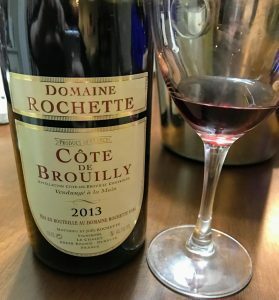 A few quick thoughts on the 2013 Domaine Rochette Côte de Brouilly from Beaujolais. 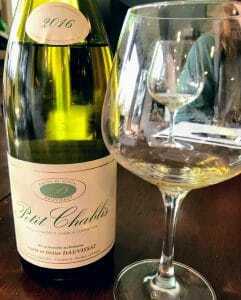 Domaine Rochette was founded by Joël and Chantal Rochette in 1981 with 15 ha (37 acres) of vines. In 2009, the Rochettes were joined by their son, Matthieu, who is charge of winemaking. 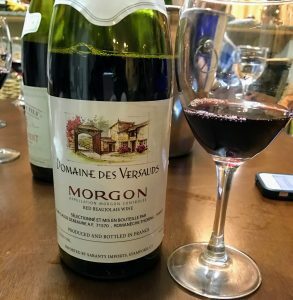 Joël is the great-great grandson of Joseph Jambon, the 19th century Villié-Morgon vintner, and is a member of the notable Beaujolais winemaking family that today includes several estates such as Jambon Père et Fils, Philippe Jambon and Domaine Marc Jambon. Among the Rochette family’s holdings are vines in 4 of the 10 crus of Beaujolais–Côte de Brouilly, Régnié, Brouilly and Morgon–with many parcels over 100 years of age. The vineyards of Côte de Brouilly are located on the slopes of the ancient volcano, Mount Brouilly. 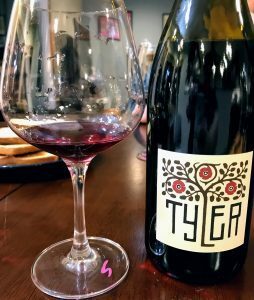 The granite and diorite-rich soils of the slopes are tended to by around 50 growers, producing wines that Hugh Johnson notes in his Wine Companion are characterize by their strength and concentration as well as “high-tone scent of violets” that develop with bottle age. Around 300-350 cases a year are made. The cinnamon spice note is more pronounced on the nose than the palate. Medium intensity nose with red fruits–candied cherries, currants–and some cinnamon spice. The nose actually reminds me of Mike & Ike Hot Tamales candies. There is a subtle floral element but its hard to make out behind the spice. On the palate, the red fruits carry through but the cinnamon spice is toned down quite a bit. 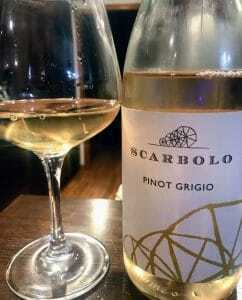 In its place is a little brambly earthiness but the medium-plus acidity and juicy red fruit is the dominant note. Medium tannins are firm but not biting. Moderate finish ends on the fruit. While the lively acidity and juicy fruit are still holding up, I wonder if the “high-tone” floral notes and added layers of complexity have came and went in this bottle’s evolution. 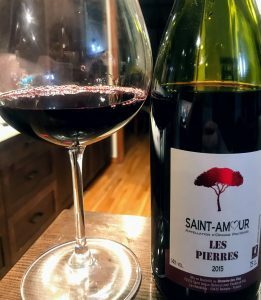 Still, for around $15-20, this is certainly a very food-friendly and enjoyable Gamay. Tagged Beaujolais cru, Brouilly, Côte de Brouilly, Domaine Marc Jambon, Domaine Rochette, Gamay, Hugh Johnson, Jambon Père et Fils, Joseph Jambon, Morgon, Mount Brouilly, Philippe Jambon, Régnié, Wine Companion.